The portable drive known as My Passport SSD offers transfer speeds up to 515 MB per second, being compatible with USB 3.1 Type-C and also able to withstand falls up to 6.5 feet. Western Digital is a big name in the digital storage industry, and they have been selling USB hard drives for years now. Recently, this company also acquired SanDisk, and now they are finally introducing the first portable SSD drive carrying the Western Digital brand, simply dubbed My Passport SSD. According to Western Digital's Sven Rathjen, My Passport SSD is "Our fastest portable drive yet, the My Passport SSD is a powerful solution for people who need to move content quickly and easily wherever life takes them." Western Digital advertizes speeds up to 515 MB/s, USB Type-C and 3.1 Gen 2 compatibility, as well as full support for both Windows and macOS. This external drive can also handle 1500 G of force and drops up to 6.5 feet, offering 256-bit AES hardware encryption and password protection as well. It comes with a three-year limited warranty and can be purchased via BestBuy.com in the US already. The MSRP tags read the followingL $399.99 USD/1 TB variant, $199.99 USD/512 GB variant, as well as $99.99 USD for the 256 GB variant. 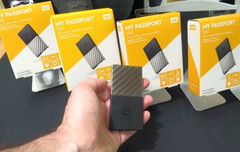 Western Digital Corporation, (NASDAQ: WDC), a global storage technology and solutions leader, today introduced its fastest WD® brand portable drive yet, the My Passport™ SSD. Featuring blazing-fast speeds and award-winning design, the new My Passport SSD complements the company's leading portfolio of My Passport palm-sized storage devices. Designed for content creators and tech enthusiasts, the new My Passport SSD combines exceptional speed and portability to manage massive files on the go. "The WD brand is focused on delivering fresh, new personal storage devices that offer amazing performance in a beautiful, yet durable design," said Sven Rathjen, vice president of marketing, Client Solutions, Western Digital. "Our fastest portable drive yet, the My Passport SSD is a powerful solution for people who need to move content quickly and easily wherever life takes them." The My Passport SSD is backed by a three-year limited warranty, and is available in the U.S. from BestBuy.com, and available worldwide at select e-tailers and retailers this quarter. The My Passport SSD has a Manufacturer's Suggested Retail Price (MSRP) in the U.S. of $399.99/1TB, $199.99/512GB and $99.99/256GB USD, respectively.